It’s the book that crushed a political hatchet man, led a world-renowned scientist to faith, and robbed a prideful entrepreneur of billions of dollars. The politician was Chuck Colson of the famed Watergate scandal; the scientist was Francis Collins, nominated by President Obama as director of the National Institutes of Health; and the businessman was Thomas Monaghan, founder of Domino’s Pizza. And the book with such transformational power to point them all to Christ was an edited collection of wartime talks by an Oxford don nicknamed Jack. Originally published in 1952, C. S. Lewis’s Mere Christianity has taken on a life of its own. The book remains favored among Christians and challenged by skeptics. In other words, it’s not going anywhere anytime soon. That’s why it makes perfect sense that George Marsden, professor of history emeritus at the University of Notre Dame, has authored a biography not so much of Lewis, but of his powerhouse publication that’s now sold more than 3.5 million copies in English alone. In C. S. Lewis’s Mere Christianity: A Biography, Marsden provides an insightful historical sketch of Mere Christianity, giving attention to the life of its author, the decade-long process of its publication, and an overview of its influence. 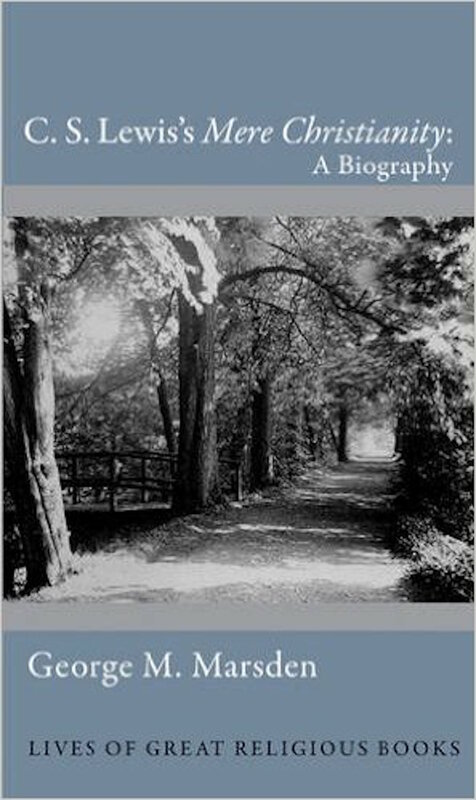 Like any book on Lewis, there’s the obligatory biographical survey of his life. But Marsden doesn’t meander. Like interstate exit signs and off-ramps, he gives enough bits of intrigue along the way that curious readers can figure out where they want to detour and peruse other sources for more details. C. S. Lewis's Mere Christianity: A Biography. Princeton University Press. 280 pages. $24.95. Lewis’s booming voice competed with Hitler’s bombs for the attention of the British people. Oxford was one of the few places Hitler didn’t blast. That worked out well for Lewis, who welcomed children from the city of London into his home for safety. But the challenge was that the British Broadcasting Corporation (BBC) wasn’t based in Oxford. It was located in London, a city often the target of daily bombing. On many occasions Lewis boarded the local train and left the safety of Oxford, riding the rails into a city described by one German pilot as an “ocean of flames.” In fact, just days after Lewis recorded his first microphone test, London absorbed its worst bombing to date. Marsden notes that the opposition Lewis faced is likely to blame for his not being appointed to an academic chair at Oxford. But God has a funny way of snickering at man-made obstacles. And his divine laughter often brings a sovereign wind of change that welcomes even greater opportunities. J. R. R. Tolkien—whose relationship with Lewis was strained in part due to Charles Williams and in part due to Joy Davidman—was instrumental in Lewis moving to Cambridge to fill the newly founded chair in medieval and Renaissance English literature. In his inaugural address Lewis compared himself, along with all other “Old Western men,” to dinosaurs. He warned his crowd to make good use of such living relics, as they would not be around forever. Lewis looks for timeless truths as opposed to the culturally bound. He uses common human nature as the point of contact with his audiences. He sees reason in the context of experience, affections, and imagination. He doesn’t offer cheap grace. The book’s lasting appeal is based on the luminosity of the gospel message itself. C.S. Lewis’s Mere Christianity is an enjoyable read and a helpful resource. I just wish it wasn’t so similar to one of my favorite books about Lewis, C. S. Lewis in a Time of War by Justin Phillips. Phillips—a BBC journalist whose father passed down firsthand memories of the London bombings—offers a unique perspective that, like Marsden’s book, focuses almost exclusively on the development of Mere Christianity. Marsden admits this similarity in his opening pages and draws from Phillips throughout. Like Phillips, Marsden offers an interesting summary of the edits Lewis made to the three books that eventually composed Mere Christianity: Broadcast Talks, Christian Behaviour, and Beyond Personality. And also like Phillips’s book, Marsden’s biography of Mere Christianity will be a resource I return to on a regular basis as I teach and write about the man called Jack.